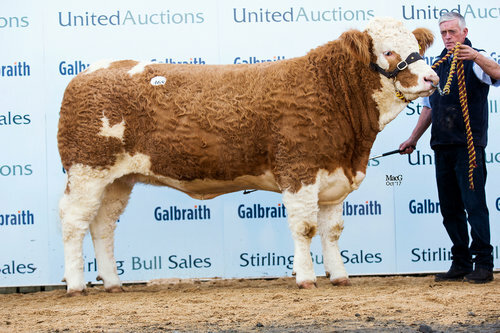 The Stirling female championship was awarded to the Nelson family with the May 2012-born Drumacritten Delia (lot 29), a Drumlone Anchor daughter out of the Dripsey Super King daughter Drumacritten Willa. Reserve to her was the second prize heifer to her, Drumacritten Dianna (lot 27) from the same home. This one is another Anchor daughter, this time out of the Omorga Murray daughter Drumacritten Andrea. Standing second in the first class of heifers was the Carter partnership with Beeches Demure 2nd (lot 28). This one is a Dirnanean Shane daughter out of the Curlieu Jasper daughter Beeches Sage. The second class saw John Hanna stand top of the line with Stralongford Diane (lot 30). This one is a Dermody Butcher daughter and is out of the Omorga Murray daughter Stralongford Tanya, herself a daughter of Lowland Hazel. Meanwhile, second place went to Sterling Samantha’s Emma (lot 34) from Boddington Estates. This one is a Silver Birch A Mans Man daughter out of the Corskie Principal daughter Sterling Martinis Samantha. Third place in this class went to Lachlan Quarm with Annick Beau’s Dominique. This one is by Skerrington Visa and is out of Annick Radiance’s Beau, an Annick Valentino daughter.